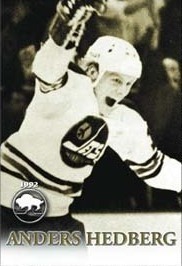 Born in Ornskoldsvik, Sweden, this right winger spent four seasons with the WHA Jets. He was named the 1975 WHA Rookie-of-the-Year. In 286 games he scored 236 goals, 222 as sists, 458 points. He was voted to the First All-Star Team three times and the Second All-Star Team once. He played on the "Hot Line" with Bobby Hull and Ulf Nilsson and won two Avco Cups (1976 & `78). Anders Hedberg had 7 NHL seasons with the New York Rangers and played 465 games, scored 172 goals, 225 assists, 397 points.